A premarital agreement, also referred to prenuptial contract, is essentially an agreement two people enter into before they get married. While a premarital agreement can be used for nearly any purpose, it’s most often used to protect each person’s assets (and designate debts), and to specify property rights after marriage. It allows a couple to alter what Texas law would otherwise do with their property, income and debts upon divorce or death. 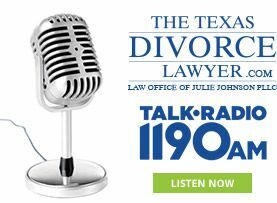 The Law Offices of Julie Johnson helps couples draft and enter into an agreement that works for them. To learn more, we invite you to take advantage of our confidential legal consultation. Call us now at 214-265-7630 to schedule an appointment. Most people associate premarital agreements with wealthy couples. But this isn’t their only purpose. protecting spouses from the other’s debts. What can a premarital agreement do? Your mind may be on wedding bells and the honeymoon, but in this day and age, it’s a good idea to sit down and discuss with your fiancé the option of a prenup. Without a premarital agreement, the court may ultimately decide whether property is separate property (belonging only to the one person, with no rights to that property for the other person) or community property (property that belongs to the couple jointly). The courts will get to decide how everything will be dealt with in the instance of divorce or death. any other rights or obligations that are not in violation of public policy or a statute imposing a criminal penalty. The premarital agreement is signed by the parties prior to marriage. If you and your partner wish to make changes to the agreement in the future, we help with that, too. A premarital agreement can be amended or revoked after marriage if it’s put in writing and signed by the parties. The parties must also either give financial disclosures to each other or sign waivers of financial disclosures. Although the agreement does not have to be recorded, it may be wise to record it among the deed records in the county where a party resides and in the county in which any real estate is located. Filing provides constructive notice to a good-faith purchaser for value. Premarital agreements are very complicated and they’re legally binding, so you’ll want to consult a family law attorney at Law Offices of Julie Johnson for help drafting the document. Again, please feel free to contact us for a consultation about creating a premarital agreement. We’ll help you and your fiancé start your new life together with a greater sense of security. Call us at 214-265-7630 today.